Since, here, we are kind of starting to drift off beyond the garden and into talking about trying to live responsibly, loosely speaking, I’ve been thinking lately about sponges. These aren’t real sponges but that’s what we pretend they are. And I know they’re filthy yet we pretend to “clean” our dishes with them. Here is the culprit, in the sink next to the dishwasher that rarely gets used because of my efforts, as I said, to try to live somewhat responsibly. 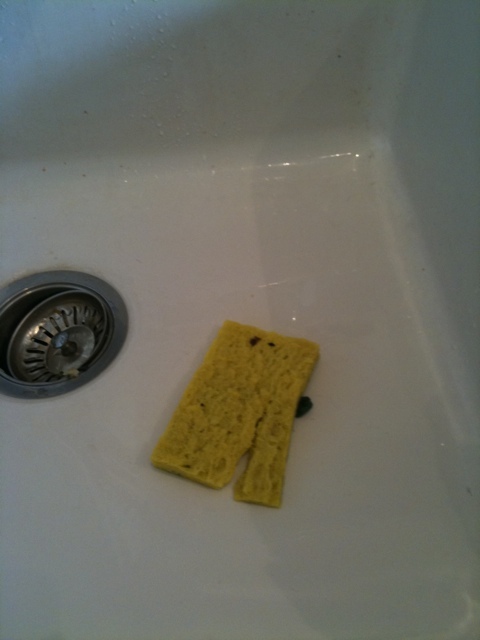 That said, how responsible can it be to wash my dishes with a dirty sponge. Of course I rinse it out and squeeze it before using it each time but still I can almost feel the bacteria seeping through its pseudo-pores. My partner keeps a dish of soapy water next to the sink and uses that instead of wasting loads of water each time we need to clean dished. Even with that, I’m sure there’s bacteria that accumulates there as well. I used to put a drop of bleach in it to ward off the little bastards but now that I’m getting into the living somewhat responsibly, the thought of bleach, the plastic it comes in and all its nasty chemicals makes me shudder. I’ve been on this earth, let’s just say, awhile now. And one of the things that continues to stump me is …. QUESTION: what tis the best way to clean dishes (in a way that isn’t really just a foolhardy practice of moving germs around), without using nasty chemicals or wasting water? Also, does dish soap really do any dish or anyone else any good? Is a dish soap that’s marketed as an eco-friendly one either eco-friendly or effective? Go ahead (even though I’m sure there’s plenty already on my dishes) … Gimme the dirt!